Continuing with the practices of Pawanmuktasana Series 1, description of Half Butterfly Asana, Hip Rotation and Full Butterfly Asana is given in the current post. These three asanas help to relieve tension in the inner thigh muscles and remove the tiredness from long hours of standing, walking or running. These asanas also help in loosening up the hip joints and prepare the practitioner to sit in meditative poses. Bend the right leg from knee joint and place the foot on the left thigh without straining. Place the heel of the right leg at the left groin, but again without straining. Put the right hand on top of the bent right knee. Push the right knee down with the right hand and try to touch the knee to the floor. While breathing in, move the right knee up and close to the chest. While breathing out, push the knee down back to the initial position trying to touch the floor. Do not force the move in an effort to touch the knee to the floor. Initially practice 5 to 7 up and down movements. After 5 to 7 such movements synchronized with the breath, practice 15-20 up and down movements in quick succession, this time keeping the breath normal and not related to the movements. The trunk should not move during the practice. The practice of Half Butterfly loosens up the knee and hip joint. This asana should be practiced by people who find it difficult to sit in cross-legged positions. 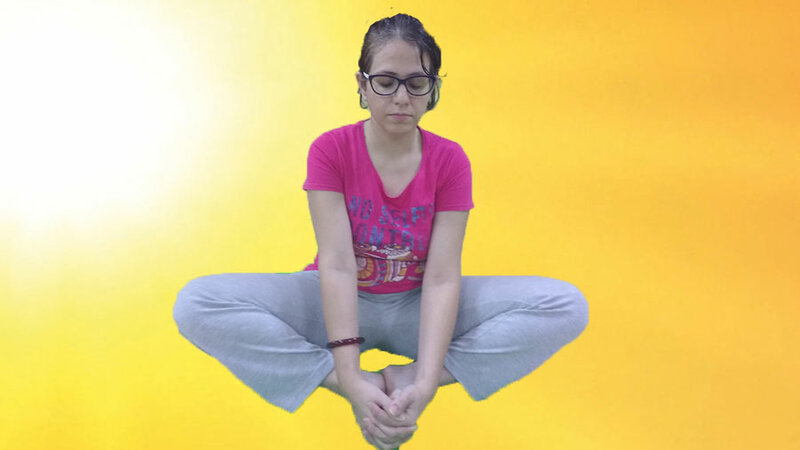 Ardha Titali Asana prepares people to sit in meditative poses like Padmasana and Siddhasana. Rotate the right knee in a circle using the right hand. Try to make the circular movement as large as possible. Become aware of the impact on the hip joint, inner thigh muscles and other parts being affected by the movement. Practice 3 to 5 clockwise rotations and 3 to 5 anti-clockwise rotations. Repeat the same process with the left leg. Bend the legs from knee joints and bring the soles of the feet together. Clasp the feet with both hands. Keep the heels as close to the body as possible. Slowly and gently move the knees up and down without applying any force. Practise 20 to 30 up and down movements. After 20 to 30 up and down movement as above, place the hands on the knees. Gently push the knees down towards the floor, without applying any force. With the use of hands bring the knees close to each other. Again repeat the movement 20 to 30 times. Straighten the legs and relax. Become aware of stretches in the inner thigh muscles and the impact on hip joints during the practice. People suffering from sciatica and sacral conditions should avoid this asana. Poorna Titali Asana stretches the inner thighs and relieves them of accumulated tension. The practitioner of this asana attains the mastery to sit in Padmasana and other meditative poses. Poorna Titali Asana is the best exercise for relaxing and stretching the aching thighs. Titali Asana helps to open up the hips and thighs and improves flexibility.